We are able to offer a wide range of videography packages to best suit your requirements; in each case, we will follow you from the very start of your event all the way through the day, to capture the atmosphere, and the details that best tell your story. Our packages are tailored to various type of events and are flexible to suit your needs best (i.e. different time coverage, elopement, engagement etc). 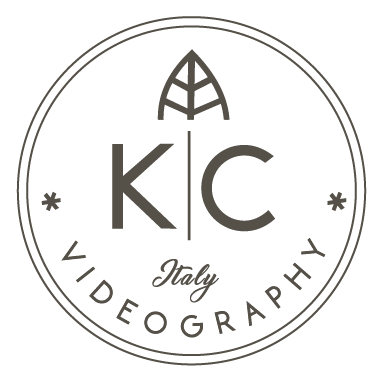 If you wish to know more please drop us an email at info@katiacasprini.com and we will be happy to go through all the options with you. Discretion and attention to detail are paramount and characterise our style. We are aware that we are witnessing one of your most precious days, and we take care of capturing every moment of it with no interference in order to create a genuine and emotion filled reportage/style film of your day; we work in a pair and personally attend every event from start to finish, and the films are carefully and professionally edited and produced by ourselves. Are you equipped and licensed to use a drone for aerial filming? Yes, we are equipped with a fully ENAC certified drone and we are authorised to drive it for our films. Our drone is correctly and safely utilised for obtaining suggestive and panoramic views of the landscape around you; we will be discussing with you before the event which locations and moments will best suit for aerial filming. Our 2019 cinematographic equipment includes Fujifilm mirrorless 4K cameras, gimbal, tripod, environmental and lapel microphones. We always and only use natural light because we love it as we find there is really no need to alter it. What is your timescale for delivering our film? The wedding trailer is delivered within two months from the event and the wedding film within three months. It all comes in a USB device safely stored in a personalised box. Our studio is located in fabulous Tuscany, in the Chianti Region between Siena and Florence. We are available to travel all over the country and abroad on request.